DNA is the ninth studio album by the Backstreet Boys, released through K-Bahn and RCA Records from Sony Music Entertainment on January 25, 2019. That they are still around is testament to something still working. DNA’s a best-case scenario for a name thought to be finished over a decade ago, a careful balance of necessary modernization and embrace of the group’s boy-band legacy. Say what you will about the Backstreet Boys, but they know what it means to age gracefully. With DNA, a revitalized Backstreet Boys exude an assured confidence, taking enough steps forward to continue their pop maturation without ignoring the hooks and harmonies that carried them all this way. The fruits of experience are apparent in the Backstreet Boys’ new album DNA as they share a new sense of maturity and passion through their music. DNA can feel disjointed at times and not all of its ventures are fruitful, but the album displays Backstreet Boys stripped of all pretense and name recognition, fully leaning into their desire to explore new waters and expand their sound. Musically, the Backstreet Boys on "DNA", their meanwhile ninth studio album, leave nothing to chance. Even in a short time hardly anyone will remember "DNA". Backstreet Boys deliver on their new studio effort, DNA. There is something in it for everybody. Why they so crazy? We don’t know but they’re our nutcases. It may not catch the mood but DNA is an appealingly nostalgic release from a group clearly built to last. It's good - actually, a bit better than I expected it would be, especially given the current state of modern pop and how much I was not on-board with 'Don't Go Breaking My Heart'. They are still hanging on to the boyband stamp as this record is stacked with delightfully cheesy vocal ad-libs and cliché-laden choruses – as you would expect from a boyband. "DNA" is a completely successful album and celebrates said long band history once more. No matter how much the music landscape has changed since the band's inception in 1993, one thing's for sure: the Backstreet Boys know their identity and run with it. “DNA” is a contemporary album, with EDM filtering through the arrangements, evoking a moody blend of melancholy, romance and sensuality. DNA stays true to BSB’s harmony-driven pop sound while evolving their production to fit today’s radio landscape. The five-piece have kept what is their signature sound - five-piece harmonies have been at the heart of all their songs, but they don't appear to have brought anything new to this album. 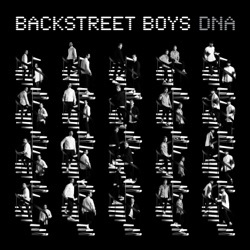 DNA is the strongest album that Backstreet Boys have released since their classic 2000 release Black & Blue. Songs like “Breathe” and the Shawn Mendes-co-written single, “Chances”, don’t sound like anything the one-time chart-toppers have released before, proving the boys are capable of moving forward. The Florida five-piece have emerged from post-boy band life with a surprising degree of dignity — and they can actually sing. Well-manicured music that cannily plunders contemporary chart sounds and plonks a pitch-perfect harmony on them. While admittedly catchy, the first single is also slick, boring and doesn’t even sound like Backstreet Boys. Towards the end of the CD it is getting more and more thin ... How can you sink so low! Mostly this standard boyband fare, reheated, and topped with modern pop sprinkles. It just feels so unnecessary. Never disappoints With only 2 singles released, you can just tell how awesome this album is going to be. Truly great vocals, harmonies, and soul. 25 years and going strong! Fan since the beginning! Our BSB is like Fan since the beginning! Our BACKSTREET BOYS are like fine wine they just get better with age! I can't wait for the entire CD. Love you all! Wow! Just from listening to these two songs, this is going to be a great album! Thanks BSB!